Eugene (Aug 17)--Oregon Criminal Deborah Ellen Frisch will have a busy month ahead of her, according to a Lane County Court calender released today. 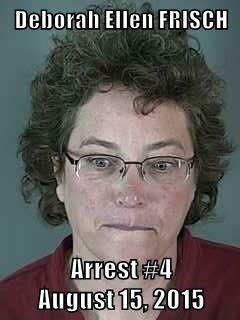 Miss Debbie was arraigned, in jail, on charges of Menacing and Abuse of the 911 Call System this afternoon. She pleaded not guilty. A Pre-Trial Conference on the charges, both Class A misdemeanors, has been scheduled for September 21st. Frisch's probation-violation hearing, originally scheduled for this morning, has been postponed until August 31st. In a surprise addition, there will be two hearings on September 14th, in which Frisch's victims will petition for restraining orders against Debbie's escalating stalking, harassing and threatening behavior. Frisch has been behind bars since midnight Saturday. It is unknown whether Miss Debbie will remain jailed until her probation-violation hearing, or whether she may skate early on a Capacity-Based Release. Stay tuned!